Tokyo, Akira Ikeda Gallery, Jiro Takamatsu: Shadow Painting, 1997, cat. no. 189 (illustrated). Painted in 1997, Shadow is a late example of Jiro Takamatsu's elegant and enigmatic "Shadow Painting" series. Spanning most of the artist's career, from 1964 right up until his death in 1998, the series combines playful elements of Surrealism with the visual refinement of Minimalism to produce the stark but powerful imagery that has come to define Takamatsu's style. The artist has cited several sources of inspiration on his oeuvre, including the intimations of human figures that are seen through the paper sliding doors in traditional Japanese domestic settings, as well as the haunting shapes of human bodies that were imprinted onto walls after the nuclear explosion in Hiroshima. In some ways, this combination of antithetical influences-one of them a cultural fondness, the other a painful memory-anticipates the presence of contradictions in Takamatsu's series. His imagery often recalls the visually flat figures of 19th-century Japanese woodcuts and paintings, which Takamatsu reimagines using contemporary motifs-in the case of the present lot, a 20th-century woman riding a modern-day bicycle. A cool gray silhouette against an undecorated background, Shadow is visually pure and atmospherically serene. 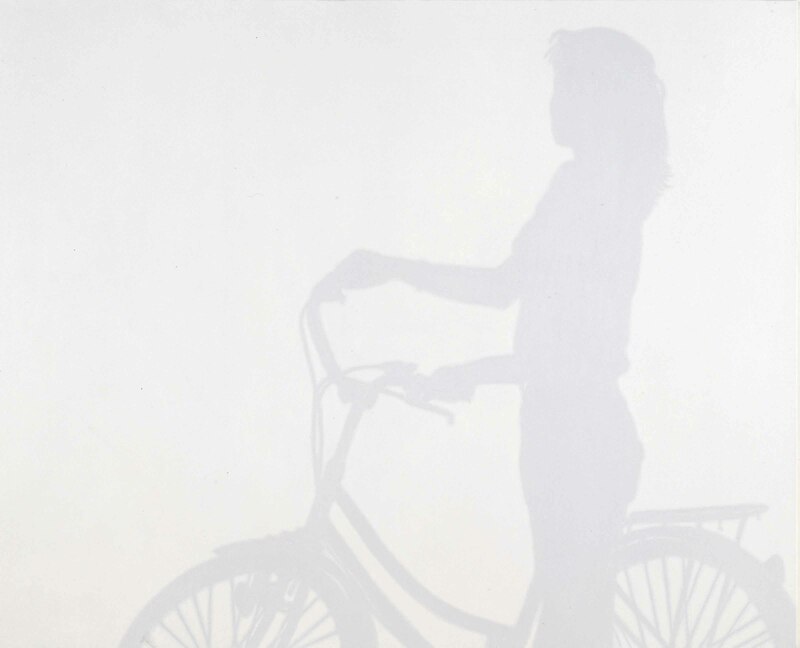 However, the painting is not an authentic depiction of a woman and her bicycle, but rather of the shadow that they have cast onto the canvas. In consideration of this absence of traditional subject matter, Shadow suddenly becomes conceptually provocative. As viewers, we are forced to understand that we are not witnessing reality as it presently exists; we are viewing either the projection of a reality from a source that remains invisible to our eyes, or trace remnants of one that no longer exists. As visually refined as Takamatsu's "Shadow Paintings" are, it is this illusionary challenge, and the momentous influences from which it derives, that establish works like Shadow as profound in their own right.